Ho Ho Ho Santa's been very busy. 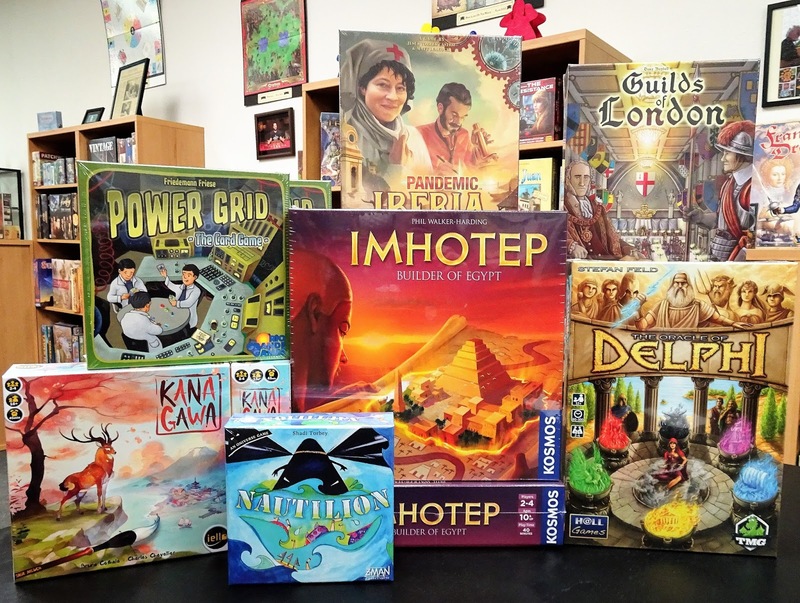 Come in and see all the exciting new games that arrived this week. 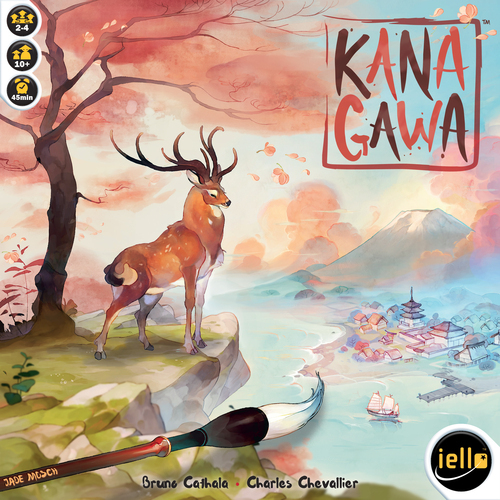 New from Iello is Kanagawa a card drafting, set collection game that plays in 45 minutes. In this strategic game, players are art students building up their studios so they can paint the most beautiful panorama. You must carefully choose your lesson cards. Each lessen card has a duel purpose. It can be used as a painting in your panorama or as resources for future painting requirements. Kanagawa has cool components and beautiful artwork on the cards. The game board is a bamboo mat and players use brush pawns. 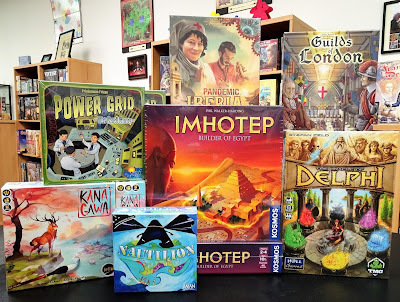 Pandemic Iberia is a cooperative game where you all win or you all lose. Set in the mid-19th century, Pandemic Iberia, puts you in the roles of members of The Second Royal Philanthropic Expedition. 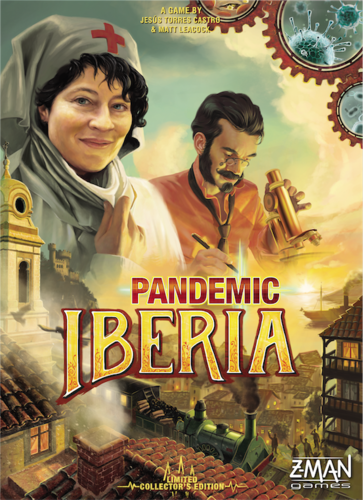 You are embarking on a mission to discover the origins of diseases that are devastating the countryside of the Iberian Peninsula, but the modern technologies that have inspired Pandemic's original mechanics in 2008 are nowhere to be found, obviously. You will travel by carriage, boat, and train to help the Iberian populace. In addition to treating patients and sharing your research, you will develop railways and purify water to help you contain the spread of disease. Outbreaks and epidemic spread the diseases at an alarming rate. Can you save humanity? 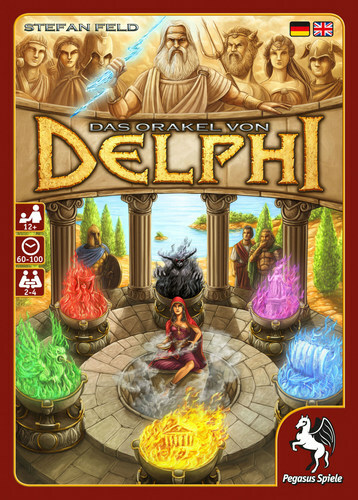 The Oracle Of Delphi is a new game by game designer, Stefan Feld (Castles Of Burgundy, Bora Bora, La Isla, and many more). Zeus, Greek god of thunder and sky, hosts a competition for the most valorous mortal captains. So you ready your ships and sail the Aegean to be the first to complete his 12 tasks: erect graceful statues, raise awe-inspiring shines, make generous offerings, and slay the most fearsome monsters. In order to find the righteous path onward, you question Pythia, the mysterious oracle of Delphi and let her divination's guide your ways. Also new from Tasty Minstrel Games is Guilds of London, an area control game for 2 to 4 players. 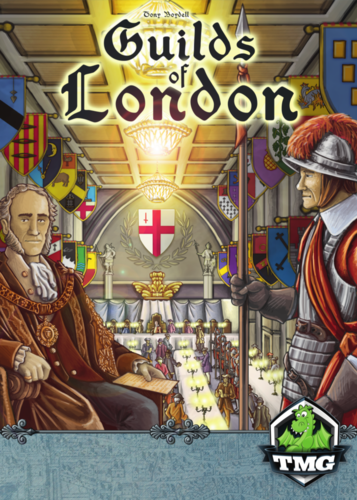 Guilds of London is set in the late medieval period of London where the Guilds played a major role in the lives of London's citizens; controlling the way in which trade, manufacturing and business was conducted. In Guilds of London, you will place your liverymen in newly-forming Guilds, building your power base so they can achieve the status of Master. You will also have the opportunity to spread your power overseas to the lucrative Ulster or Virginia plantations. Control of each Guild will provide victory points and additional actions that you can exploit, so you can control the future development of the City. 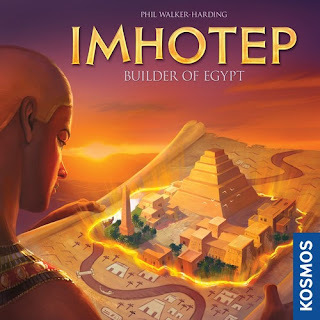 Imhotep is a game of building monuments by the famous Egyptian architect, Imhotep. Players quarry and transport their stone blocks on ships to various construction sites to end up in the most valuable positions. But you alone do not control which sites the ships go to. Depending on where the blocks end up, players earn different point values. Nautilion is a cooperative game for 1 to 2 players that plays in 30 minutes. Take the helm of a Nautilion submarine and recruit a heroic crew to vanquish the treacherous Darkhouse that lurks in the oceanic depths. 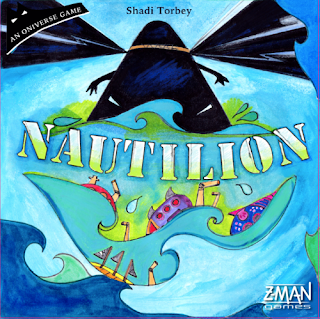 Nautilion is a dice game in the Oniverse. Skillfully assign these dice to make your way to the Abyss with a full manned submarine to assure your victory. 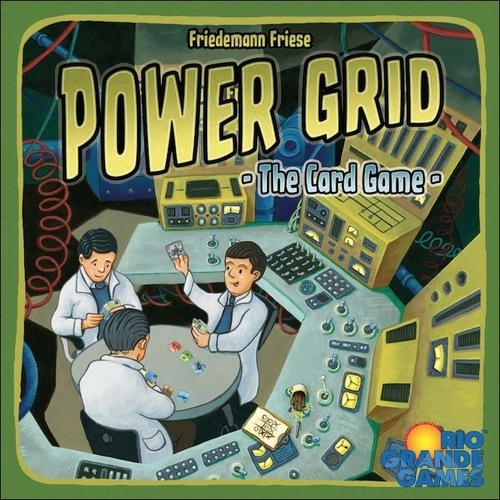 Fans of the strategy board game,Power Grid will surely like Friedemann Friese's new card game format. You get the full Power Grid emotions in an intensive 60 minutes. 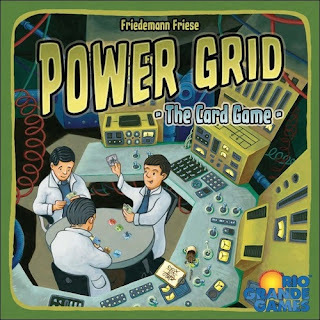 In Power Grid: The Card Game, playes represent CEO's of mighty power companies producing electricity. 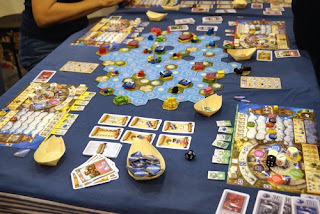 During the game, players will bid for power plants at auctions and supply them with resources. Their income depends on the amount of electricity produced in each round. At the end of the game, the player who produces the most electricity wins the game. 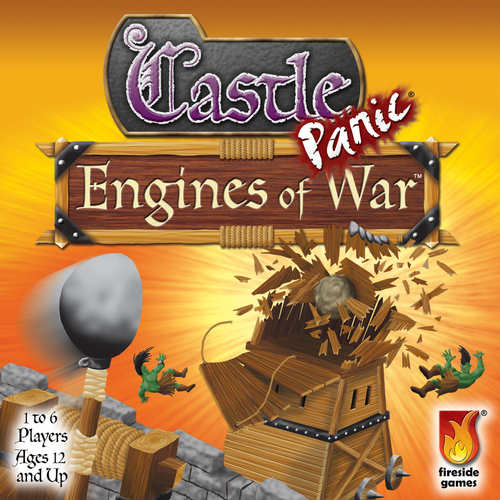 New in from Fireside Games is Castle Panic: Engines of War, the third expansion to their popular cooperative game, Castle Panic. Engines of War introduces a light economic mechanic to the world of Castle Panic. The Engineer uses new Resource cards to build Catapults, Ballistas, Barricades, and more to better defend the Castle from the growing Monster threat. They charge into battle with a Siege Tower, War Wagon, and a Battering Ram. And they’ve enlisted the help of a Shaman, Breathtaker, and Goblin Saboteurs. Prepare your forces! The fight just added Engines of War!